Published on March 17, 2016 by Martyn. Be the first to comment! 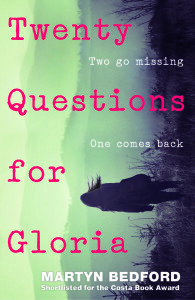 It’s not often an author gets to meet the characters from one of his novels but that’s what happened to me (sort of) during a recent visit to a school in West Yorkshire to promote my new YA novel, Twenty Questions for Gloria. Way back at the beginning, this novel was going to be called The Fourth Wish and would feature a genie. While I was still roughing out a plan for the book I visited Scissett Middle School, near Huddersfield, to run some creative writing workshops. While I was there I invited the students to enter a competition by answering the question: ‘If you were granted three wishes, what would you wish for?’ The prize? I would choose the answer I liked the most and name one of the characters in my novel after the winning student. In character (as themselves): Tierney Rhodes, left, and Jade Ellis. And me. And so the fictional heroine Gloria Jade Ellis and her best friend Tierney were born. The novel altered beyond recognition on its journey to publication – no genie, for one thing, and no time travel – but the 243 wishes produced by the 81 students who entered the competition were an invaluable part of the process. So, I was very pleased to be invited back to Scissett for the Pageturners Book Festival to give a reading from the novel . . . and even more delighted to say hello to the real Jade and Tierney, who are now in Year 11 at Shelley College but who’d been allowed to return to their old school for the event. It also gave me a chance to thank them in person for their contribution to Twenty Questions for Gloria and to present them with signed copies. 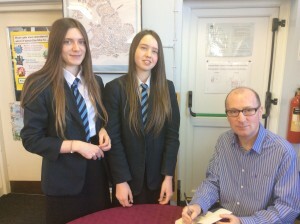 I am grateful to Toni Mann, one of the English teachers at Scissett, for allowing me to use the photograph of me and the girls, to her colleague Maura Ryan, who organised the three-wishes competition for me (and who has a police detective in the novel named after her! ), and to Linda Dyson, the school librarian for hosting my latest visit.